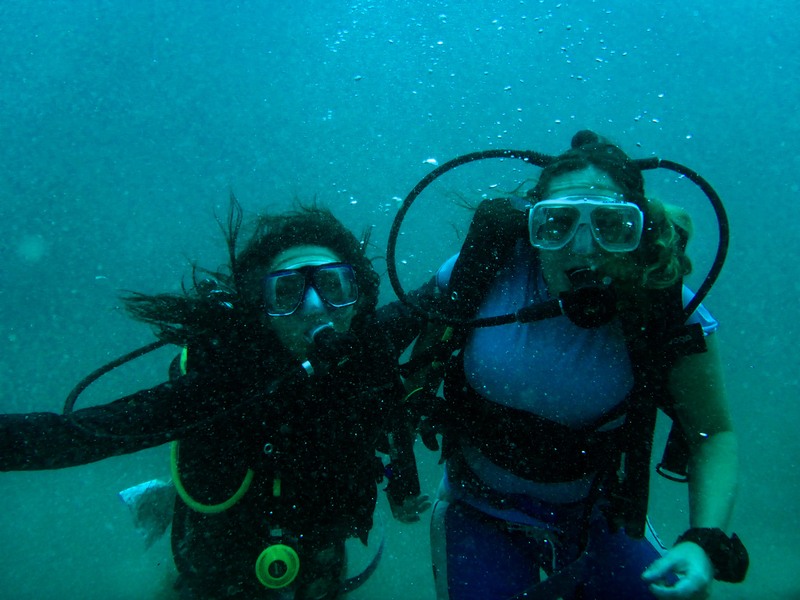 Tropical fish and bright coral reefs abound while scuba diving in Bocas del Toro, Panama! 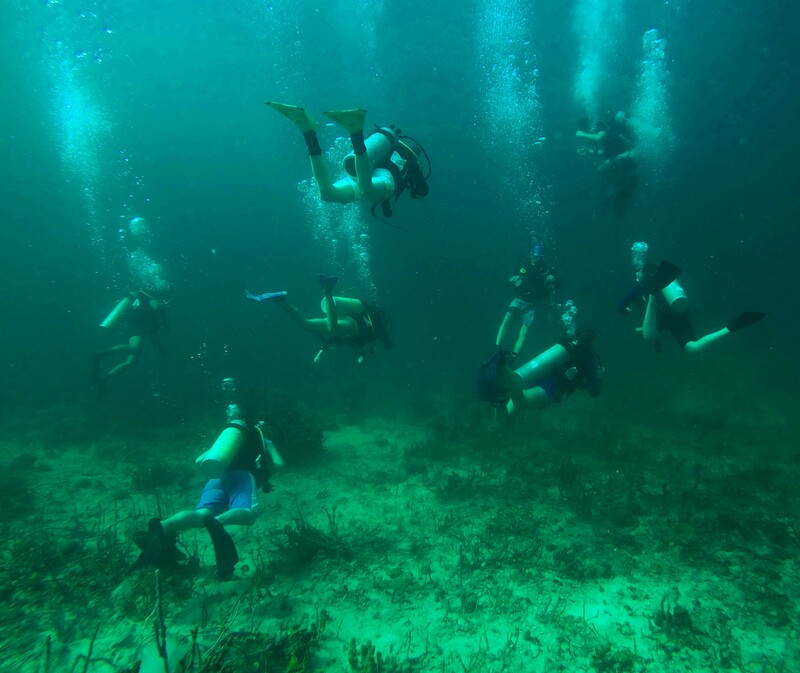 Some of the most pristine nature in Central America is found offshore, and with this in mind, scuba diving is one of the most popular activities for visitors to the subcontinent’s coastlines. Whereas Mexico, Belize and Honduras may be more popular destinations for divers, Panama offers less crowded locations for scuba diving with great visibility and interesting underwater ecosystems to explore. Panama, the Southern-most country in North America, is bordered by two bodies of water – the Pacific Ocean and Caribbean Sea. 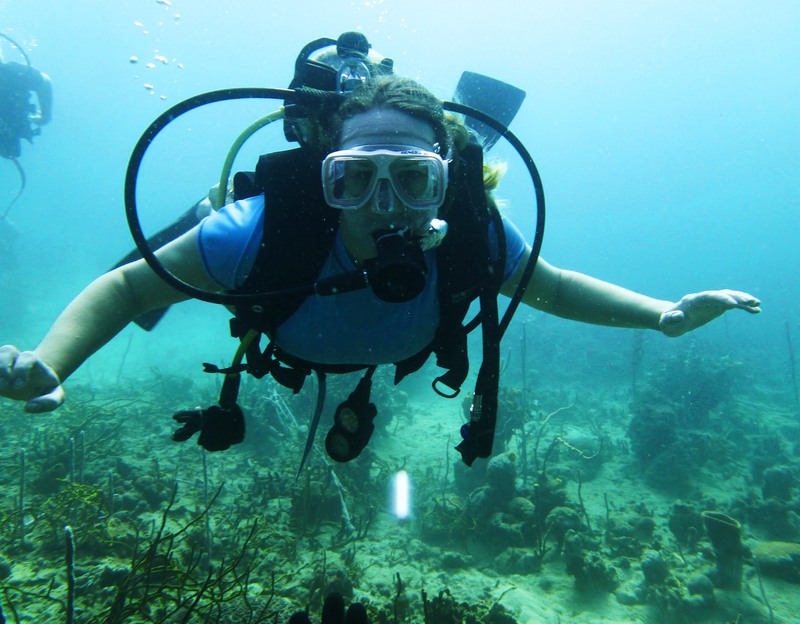 With warm waters and stunning coral reefs, the Caribbean side of the country is an ideal place to learn scuba diving. 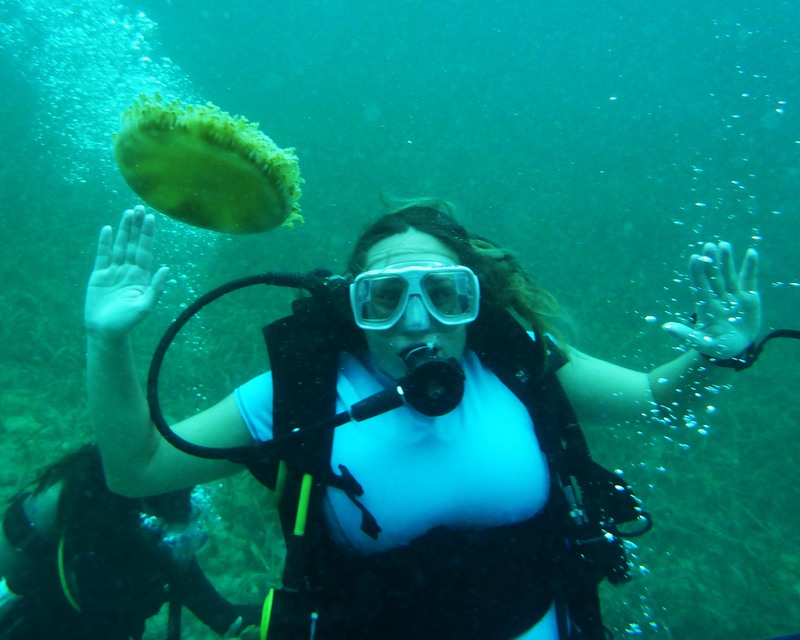 I recently had the opportunity to visit Panama with the company I work for in Costa Rica and earn my NAUI scuba certification. 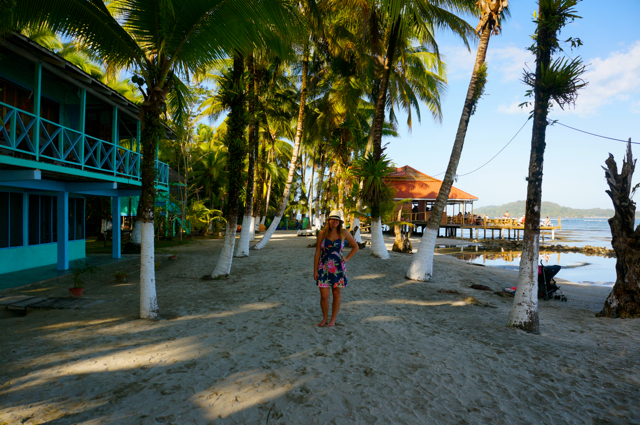 We headed to Bocas del Toro, an archipelago of islands that is less than 20 miles from the border of Costa Rica. The archipelago de Bocas del Toro consists of nine islands, inlets and miles of dense mangroves. Christopher Columbus came here in 1502 on his final voyage to the New World. The largest and most developed island in the archipelago is Isla Colón, home to Bocas Town, which has just the kind of laid back yet energetic vibe you’d expect from a Caribbean island town. Bocas Town is very touristy, but there are still many locals milling about and it retains its unique culture. The rest of the islands in the archipelago are primarily inhabited by Panamanians with indigenous ancestry. The majority of dive operators are located in Bocas Town on Colón. Though, once in Bocas del Toro, you don’t have to go very far to find dive sights; the best locations for diving are just offshore, accessible within five to ten minutes by boat. I spent five days study the ins and outs of Scuba diving with book learning, classroom tutorials and practice dives. 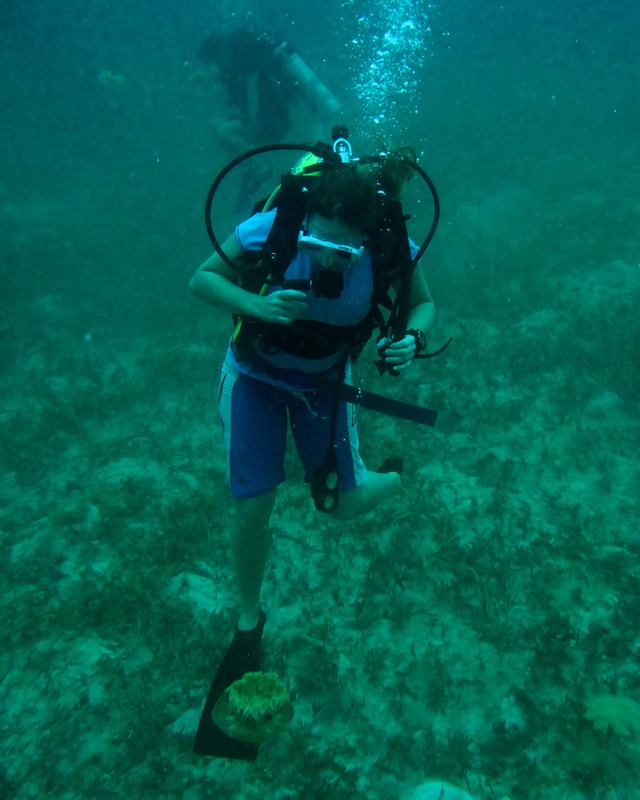 SCUBA stands for Self-Contained Underwater Breathing Apparatus. The first workable, full-time SCUBA was invented in 1825 by an Englishman. However, the history of modern scuba really began in 1943 with the invention of the aqualung. Recreational diving is a fast growing sport. Today an estimated 500,000 new scuba divers are certified each year in the United States. Basic dive equipment includes a mask, fins, weight belt and a BC, or buoyancy compensator, a jacket that can be inflated or deflated as necessary. The BC attaches to an air tank, and regulators allow you to breathe air from the tank while underwater. The BC also has a console, which contains a pressure gauge, depth gauge and compass, important tools for staying safe while diving. The waters in Bocas del Toro are so warm that a wetsuit isn’t necessary. A rash guard, however, will make you feel more comfortable. Before we could dive, we had to learn basic dive skills, which included regulator clearing (knowing how to clear water out of the breathing apparatus if it disconnects from your mouth underwater), regulator recovery (knowing how to locate your regulator without using your sense of sight if it falls out of your mouth underwater), and mask clearing. Mask clearing posed the biggest challenge for me, as I discovered I have a fear I didn’t previously know I had – the fear of opening my eyes under water. I guess spiders aren’t the only thing I’m scared of in Costa Rica! I wear contacts, and I guess over the years I have been so paranoid about having them fall out in water, that the thought of opening my eyes underwater subconsciously causes me to panic. My fear aside, mask clearing is very easy. You simply look up toward the sky, press down on the top of your mask and breathe out through your nose. Once we had mastered these basic skills, it was time for our first dive. After deflating our BC and sinking down we practiced our skills underwater and then went to explore. The emerald green waters of the Caribbean sea are home to a variety of colorful and tropical fish including parrot fish, trumpet fish, stingrays, damselfish and jawfish. A new species that has recently popped up in these waters is the lion fish. This venomous fish is not native to the Caribbean. It is thought a mating pair were brought to the sea from Asia or Florida, and using their venomous spines to deter predators, the species has been able to rapidly populate the waters. Unfortunately, the coral reefs around Bocas del Toro have lost the brilliance of their colors due to bleaching caused by high water temperatures. However, the coral reef in the area still is very colorful and gorgeous to swim around. 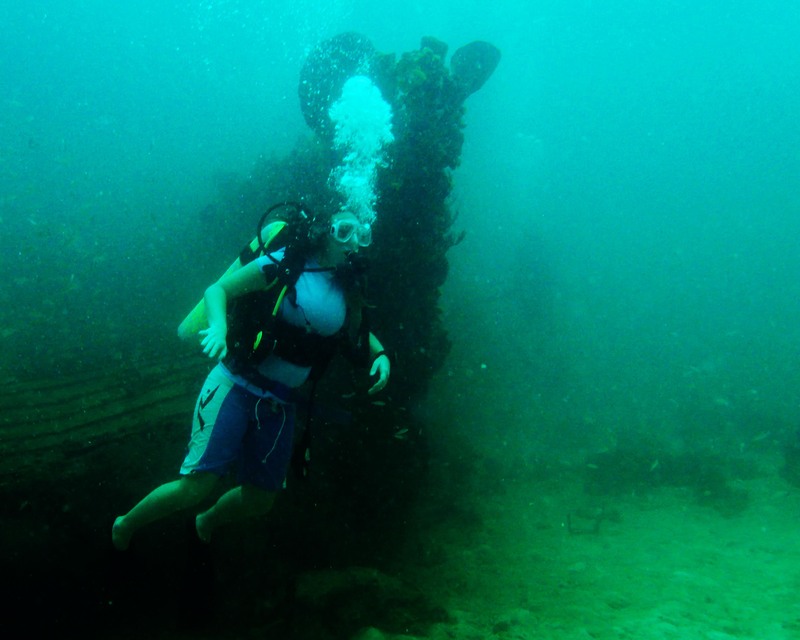 On one of our last dives, we dove near a ship wreck. Well, actually, the wreck is of an old ferry boat that was intentionally sunk in 2000 to make an interesting dive sight. We swam around and over the wreck and even discovered a shark resting on the sand bottom below the boat. We ended our diving experience with a night dive. Under the cover of darkness we flipped off the dive boat and into the water. We descended to the sea floor and sat in stillness, waiting for bioluminescence to appear. After a few moments of solitude, the first sparks of magic appeared, and soon the scene before us was illuminated by glowing plankton. The bright, full moon broke through the surface of the water. I looked up at the jagged moon, refracted in billowing curves by the gallons of water above me, and one by one I thought of all the people I love in this world. Before it came time to ascend I was flooded with one final thought in my watery solitude, and the imagery of this thought was as beautiful to me as the brilliant bioluminescence. How beautiful it is that one night a girl sat on the seafloor in Panama and looked up at the same moon all the people she loved in the world saw from their varying positions scattered across the globe. HotelsCombined offers the best rates on hotels world-wide. 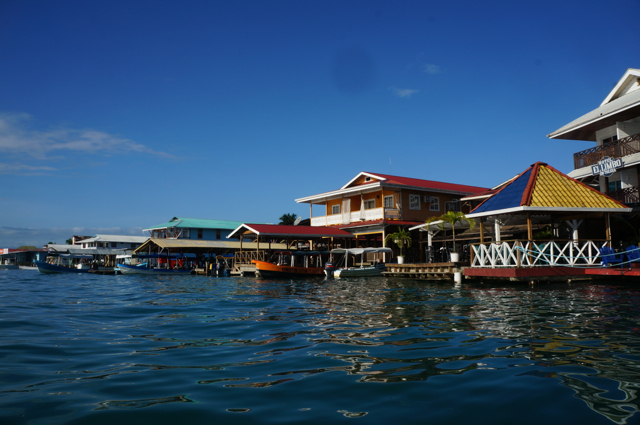 Find and book your Bocas del Toro accomodation below! Hey, how much does a single tank dives cost at Bocas del Toro? Is there any special offer available? Hi Samuel, I’m not exactly sure of the prices, but there are a plethora of dive shops in town and most offer day trips. Good luck!